Three seconds...that's about how long you have to get the attention of a potential customer walking by your trade show booth. Having the right trade show display is critical to your trade show exhibiting success. Your trade show exhibit booth needs to stand out from all the other exhibit booths and get your company noticed. 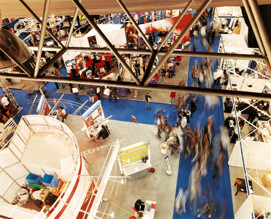 It has to grab qualified prospects and draw them into your trade show booth. Centella Consulting can help you achieve this by designing high-impact graphics specifically geared to market your products and services.